Humanity's understanding of the universe took a giant leap forward 50 years ago today. On May 20, 1964, American radio astronomers Robert Wilson and Arno Penzias discovered the cosmic microwave background radiation (CMB), the ancient light that began saturating the universe 380,000 years after its creation. And they did so pretty much by accident. And it was indeed big. Penzias and Wilson had spotted the CMB, the predicted thermal echo of the universe's explosive birth. The landmark find put the Big Bang theory on solid ground, suggesting that the cosmos did indeed grow from a tiny seed — a single point — about 13.8 billion years ago. The two radio astronomers won the 1978 Nobel Prize in physics for their work, sharing the award with Soviet scientist Pyotr Kapitsa. The Cosmic Microwave Background (CMB) radiation tells us the age and composition of the universe and raises new questions that must be answered. See how the Cosmic Microwave Background works and can be detected here. The CMB is the oldest light in the universe, dating from the first epoch in which photons could travel freely. Shortly after the Big Bang, the cosmos was a seething-hot, opaque fog of plasma and energy; things changed about 380,000 years later, when temperatures dropped enough for electrically neutral atoms to form, and the universe became transparent. 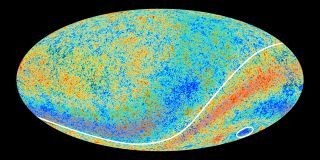 The CMB is markedly uniform, lending support to the theory of cosmic inflation, which posits that the universe expanded much faster than the speed of light just a few tiny fractions of a second after the Big Bang. "Why the cosmic microwave background temperature is the same at different spots in the sky would be a mystery if it was not for inflation saying, well, our whole sky came from this tiny region," Charles Bennett of Johns Hopkins University in Baltimore told Space.com last year. Bennett is principal investigator of NASA's CMB-mapping Wilkinson Microwave Anisotropy Probe (WMAP), which launched in 2001 and stopped gathering data in 2010. But the CMB also contains tiny temperature variations, which signify areas of different densities. These density fluctuations were the seeds that eventually gave rise to stars, galaxies and all the other structure that we observe in the universe today, researchers say. Scientists have extracted a great deal of information from the CMB over the years. In March, for example, a team of astronomers announced that they had found evidence of primordial gravitational waves in the CMB — a discovery that, if confirmed, provides a long-sought "smoking gun" for the theory of cosmic inflation. Such discoveries continue to impress Wilson. "It's amazing to me that people can dig something out that's a tenth of a part per million of the cosmic background, especially given a lot of foreground that might get in the way," he told Space.com in March. Bell Labs is hosting a 50th anniversary celebration today at its Holmdale facility, which Penzias and Wilson — who are now 81 and 78 years old, respectively — will attend, as will Bell Labs president and CTO Marcus Weldon. During the event, Bell Labs — the research arm of Paris-based company Alcatel-Lucent — will also announce the Bell Labs Prize, a competition that gives scientists around the globe the chance to introduce to the world their ideas in the fields of information and communications technology. The challenge offers a grand prize of $100,000; second prize is worth $50,000 and third $25,000. Winners may also get the chance to develop their ideas at Bell Labs, company representatives said. "I think it is fitting that today, as we honor and celebrate this incredible, Nobel Prize-winning achievement by Arno and Bob, we are launching a program intended to inspire world-changing discoveries and innovations by young researchers that may one day walk in their footsteps," Weldon said. "The Bell Labs Prize is intended to recognize innovators with the ability and vision to challenge the common assumptions, and find ways to revolutionize the way we live, work, communicate, collaborate and connect with each other and our digital world," he added.